No, currently there's no way to add your own presets to the Document Setup dialog or the Artboards dropdown however when designing for web or using a specific document page size (A4, A5 etc) you usually want to add artboards with the same size of the document (canvas/artboard) you are already working. 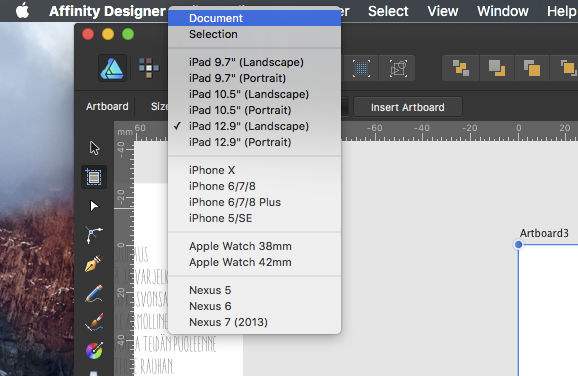 So selecting the first option - Document - from the Artboards dropdown will create a new artboard with the same size as the document you are currently working with. Another thing that may help to work around this is to create an artboard with the dimensions you want and add it to the Assets panel (just add a text object with its dimensions so you can identify it after dragging to the panel since the artboard alone will not be visible there). Then to re use it drag it from the Assets panel to the Pasteboard area. You can also duplicate artboards as if they were regular objects. Note: i've moved this thread to the Questions section.